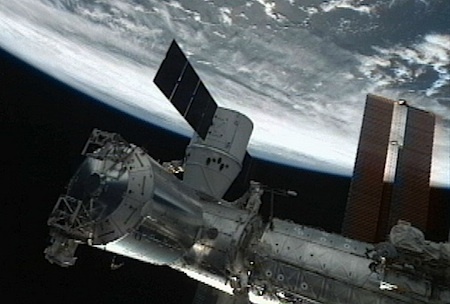 The first privately built space capsule successfully docked with the International Space Station today; SpaceX's Dragon made the first-ever commercial cargo delivery. Why, the ship wasn't a proper deep-space craft at all. It did not have an airlock but merely a seal to let it fasten to a larger ship; Lazarus was staring right into the body of the craft. It looked like - yes, it was a "Joy-boat Junior," a little private strato-yacht, suitable only for point-to-point trajectory, or at the most for rendezvous with a satellite provided the satellite could refuel it for the return leg. Via SpaceX on Google + via Winchell Chung and CSMonitor.